Is the Era of Euphemism in Washington Beginning to End? The original article has been slightly abridged. 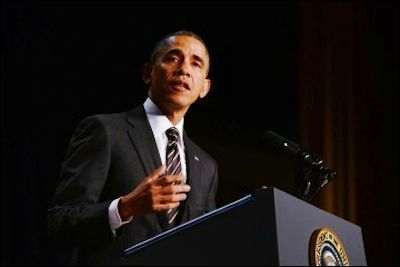 President Barack Obama addresses the National Prayer Breakfast in Washington on February 5. In years to come we may look back on the past week as the beginning of the end of an era of euphemism in American political history. It may be ending because the gap between the language of the government of the United States and the reality of Islamist inspired terror and barbarism has become an abyss. For two decades, various academics and political figures have warned us against committing the sins of Orientalism and then Islamophobia. Yet millions of people now see with their own eyes on television and computer screens that the sins of our error are being committed in the name of a fanaticism born of Islamist ideology. This fact is now so obvious that denying it leads officials into embarrassing linguistic acrobatics that make them objects of ridicule. Simply put, the past strategies of avoidance and deflection have ceased to convince because they are being contradicted by facts available to millions. Since the attacks of September 11, 2001, two American Presidents, but especially our current one, have spoken a language of euphemism concerning the ideology inspiring the major terrorist organizations and states of our era. They have substituted mild, indirect or vague terms to refer to the causes of global terrorism in place of "radical Islam," "Islamism," "Islamic fundamentalism," and other terms that connect interpretation of the religion of Islam to the practice of terrorism. Those who used such terms were held to be either "Islamophobic" or simply politically harmful because doing so was bound to offend over a billion Muslims and thus undermine Western counterterrorism efforts. As a result, two famous euphemisms continue to shape the public stance of the United States government. Obama characterized the murder of four Jews at a kosher grocery in Paris as "violent, vicious zealots ... randomly shoot[ing] a bunch of folks." In the Bush years, the term of art was "the war on terror," which absurdly suggested we were at war with a tactic. In the Obama era, the acceptable term has been a fight against unspecified sources of "violent extremism." This past week, President Obama hosted a conference in Washington on confronting "violent extremism" in the wake of the rise and expansion of ISIS and the barbarism for which it is now world-famous. Yet the very effort to defend past practice may have accelerated criticism of the era that began in the universities decades ago and became a key element of US foreign policy since 9/11. The bubble began to burst on February 10. In an interview with the website Vox, the President characterized the attack in January on the Hyper Cacher kosher grocery in Paris in which four Jews were murdered: "a bunch of violent, vicious zealots ... randomly shoot[ing] a bunch of folks in a deli." To anyone who followed the news on even the most casual basis, it was obvious that there was nothing random about the killer's choice of victims; he killed them because they were Jews. The gap between the obvious antisemitic motivations of the killings and the President's refusal to say so caused a media storm. As the journalist James Kirchick put it, Obama's statement "gives us further evidence that willful denial of reality forms the core of the Obama administration's approach to radical Islam." If I remember the victims specifically, they were not all victims of one background or one nationality. So I think what they mean by that is, I don't know that they spoke to the targeting of the grocery store or that specifically, but the individuals impacted ... I don't think we're going to speak on behalf of French authorities and what they believe was the situation here. It's an issue for the French government to address. How could the administration deny the obvious facts that by February 10 were known to millions of people around the world? The families of all four victims killed in the terror attack on a kosher grocery in Paris in January chose to bury their loved ones in Israel. The denial, Kirchick continued, followed "naturally from the administration's worldview" and from the resulting "hesitance to admit that we are at war with a radical Islamist ideology" and that its targets included Jews as well as Americans. Kirchick suggested that the President was adopting a "realist" calculus that led him to be "more concerned with not angering the world's 1.3 billion Muslims than with reassuring its 18 million Jews." It was this "realism" that was appearing to some in the Washington press corps as an exercise in self-deception and denial and hence, not realistic at all. At this past week's conference to counter "violent extremism," the President responded to his critics and presented his views about how best to counter terrorism and think about its relationship to Islam. It is an important speech. Anyone interested in understanding Obama's approach should read it, as it expresses both his determination to fight terror and offers his fullest statement about the role of Islam in this matter. The president accuses his critics of "grant[ing] these terrorists the religious legitimacy that they seek." presumes to declare itself the "Islamic State." And they propagate the notion that America — and the West, generally — is at war with Islam. That's how they recruit. That's how they try to radicalize young people. We must never accept the premise that they put forward, because it is a lie. Nor should we grant these terrorists the religious legitimacy that they seek. They are not religious leaders — they're terrorists. And we are not at war with Islam. We are at war with people who have perverted Islam. Most of the President's critics in the mainstream of American political and intellectual life have not suggested that we are at war with Islam. Rather, they have argued that while terrorists are not religious leaders, their terrorism is inseparable from their interpretation of Islam. To deny that appears to those of us who have made this case to be as false as it was to deny that the Jews in Hyper Cacher were killed because they were Jewish. On February 5, at a "National Prayer Breakfast" of religious leaders at the White House, the President demonstrated that when he wanted to be, he could be refreshingly blunt and dispense with euphemisms where other religions are concerned. He said, with the Crusades, slavery and racial segregation in mind, that "people committed terrible deeds in the name of Christ." Obama's critics have argued that while terrorists are not religious leaders, their terrorism is inseparable from their interpretation of Islam. Yet in making those comments, Obama did not at all suggest that he was at war with Christianity. On the contrary, he is deeply aware of the role Christianity played in overcoming slavery and racism. Yet in Washington this past week, he did not display a comparable willingness to be as frank and blunt about the terrible deeds that have been committed in the name of Allah. He also passed up a splendid opportunity to compare the place antisemitism had in the history of Christianity with the central role it has played in the traditions of radical Islam in both its Sunni and Shia versions. He could have used this gathering called to counter violent extremism to draw attention to the role of antisemitism within it and to talk at length about the antisemitism expressed in organizations such as Hamas, Hezbollah and by the government of Iran. Unfortunately he chose not to do so. Those of us outside Muslim communities need to reject the terrorist narrative that the West and Islam are in conflict, or modern life and Islam are in conflict…. Of course, the terrorists do not speak for over a billion Muslims who reject their hateful ideology. They no more represent Islam than any madman who kills innocents in the name of God represents Christianity or Judaism or Buddhism or Hinduism. No religion is responsible for terrorism. People are responsible for violence and terrorism. The religion of Islam, he continued, "calls for peace and for justice, and tolerance toward others; that terrorism is prohibited; that the Koran says whoever kills an innocent, it is as if he has killed all mankind." The scholars and clerics who have interpreted Islam in that way are "the voices that represent over a billion people around the world." Yet the President must understand that there is not one Islam—like all all large cultural and religious traditions, there are texts subject to a variety of interpretations. Ironically, one precondition for an Islam that rejects terror is the abandonment of euphemisms that suggest that the beliefs of ISIS (as well as Hamas, Hezbollah, the tactically more moderate Muslim Brotherhood, and the government of Iran) are distortions rather than highly selective interpretations of traditions of Islam. The President's critics have not suggested that Al Qaeda and ISIS speak "for over a billion Muslims who reject their hateful ideology." We have, however, pointed out that these organizations have struck a chord with a minority of those billion Muslims precisely because they have been able to draw on familiar texts and ideas in the traditions of Islam. Obama maintains that Islamic terrorism is fueled by economic and political conditions, not ideology. While the President has said previously that it is necessary to squarely confront these "twisted ideologies," he did not do so this week in Washington. Instead, he argued that the terrorist organizations struck a nerve because economic and political conditions such as unemployment or denial of political and human rights had created opportunities for radicalization. Rather than focus his criticism on an Islamist ideology that had inspired the preponderance of terror of our time, he stressed that it was the narrative of the West at war with Islam that was the problem. By implication, those of us who had drawn attention to the autonomous causal impact of Islamist ideology were making things worse because by drawing attention to the causal import of Islamist ideology we lent support to the terrorist narrative of a clash of civilizations. The power of the Presidency is formidable. Barack Obama's interpretation of these issues has many advocates in the various bureaucracies of the U.S. government, and in parts of the media, sympathetic think tanks and the universities. Yet, outside the bounds of his supporters, the President's remarks this week were not received very well. His remarks about Hyper Cacher the week before had soured the mood. Understandably, his conservative critics pounced. The Wall Street Journal editorialized that the administration was "adrift on denial" about the nature of the Islamic state. Even David Brooks, the moderate conservative at the New York Times who has praised Obama on many occasions in the past six years, wrote a column criticizing Obama's refusal to grasp the distinctively religious and spiritual (rather than political and economic sources) of terrorism. Jonah Goldberg, writing in the National Review, found a "silver lining on Obama's stubborn refusal to speak plainly about the plainly obvious." He wrote, "when you deny a given truth, you force people to explain why the truth is a given. Nearly everyone agrees the earth is round, but if you meet someone who says it's flat, you're forced to explain — with facts and logic — why it's not flat." We, as Muslims, recognize every word in the Islamic State's theology from teachings, ideas and interpretations we've heard through our approximately 50 years on this earth, from the living room chatter of "couch jihadis," as one FBI agent describes "wound collectors," to sermons, Facebook posts and Twitter messages. The era of euphemism has enjoyed enormous institutional support. As journalist Paul Berman pointed out this week, in a description of a United Nations panel discussion in which he participated , efforts continue to focus more on the alleged sins of Islamophobia than on the crimes it inspires. His brilliant and subtle replies merit attention. Yet while White House conferences, gatherings at Davos and of course at the United Nations will continue to ring with the familiar euphemisms and obfuscations, the clash between words and realities has become too grim and too obvious to remain credible. As the President rightly said, it is a lie that we—the West, the democracies, and the civilized world—are at war with Islam. But it is not a lie that terrorists inspired by varieties of Islamism are at war with us. 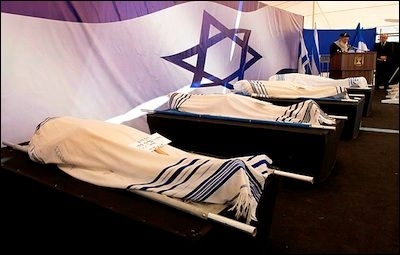 It is a message that Israel's leaders were warning about long before 9/11. Perhaps the unintended consequence of this week's White House conference on countering violent extremism is that the rest of the civilized world will now understand what Israelis have long known about the causal connection between Islamist ideology and terror.